The Sculpt Message editor is a very powerful, yet easy-to-use drag and drop editor for building custom message layouts and content without the need or knowledge of HTML coding. Before the Sculpt editor will be available for message creation, a Sculpt template and Sculpt blocks must be saved in your account. The template will be used as a starting point for your message, and the blocks will be used as draggable editable sections for building your layout and content. To get started using Sculpt, create a new message, choose the Sculpt Editor and click Continue. 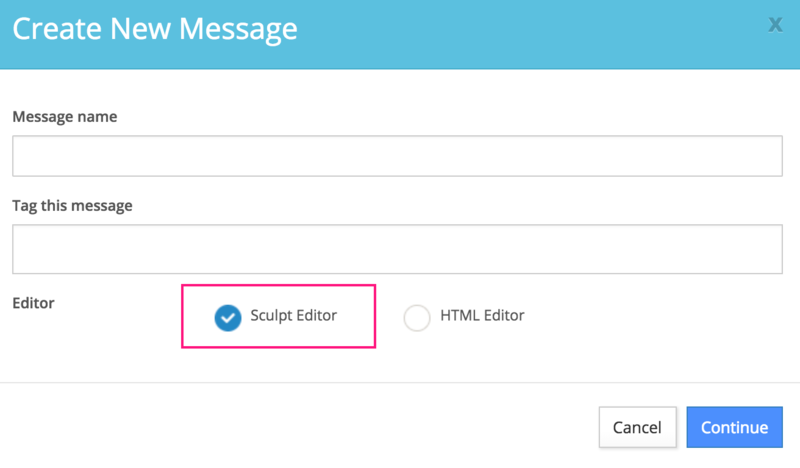 Note: The option to use the Sculpt editor for message creation will not be available until you have a Sculpt template set up in your account. 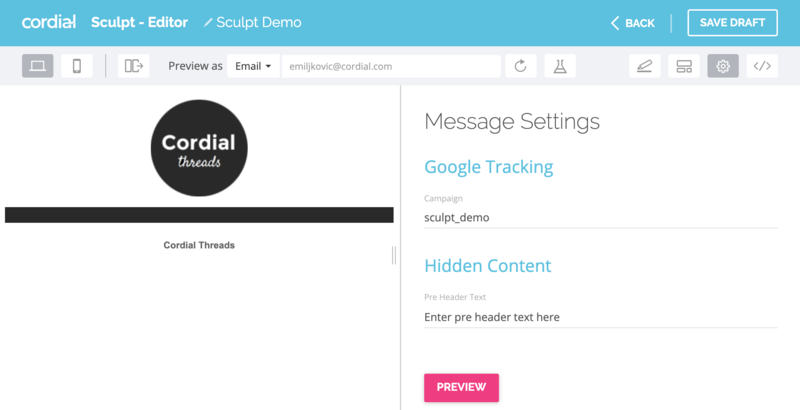 On the edit message page, in the Message Content section, you'll see the list of available Sculpt templates. Select a Sculpt template to start editing. 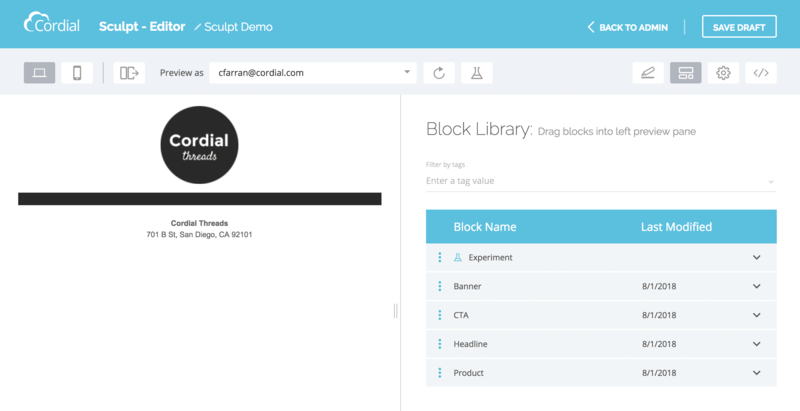 You will be presented with the Sculpt editor page. If there are editable Sculpt blocks in your template, you'll be able to select and edit them in this page. If there are no editable blocks, you will need to add them using the block library. To view your block library, click on the Block Library button. 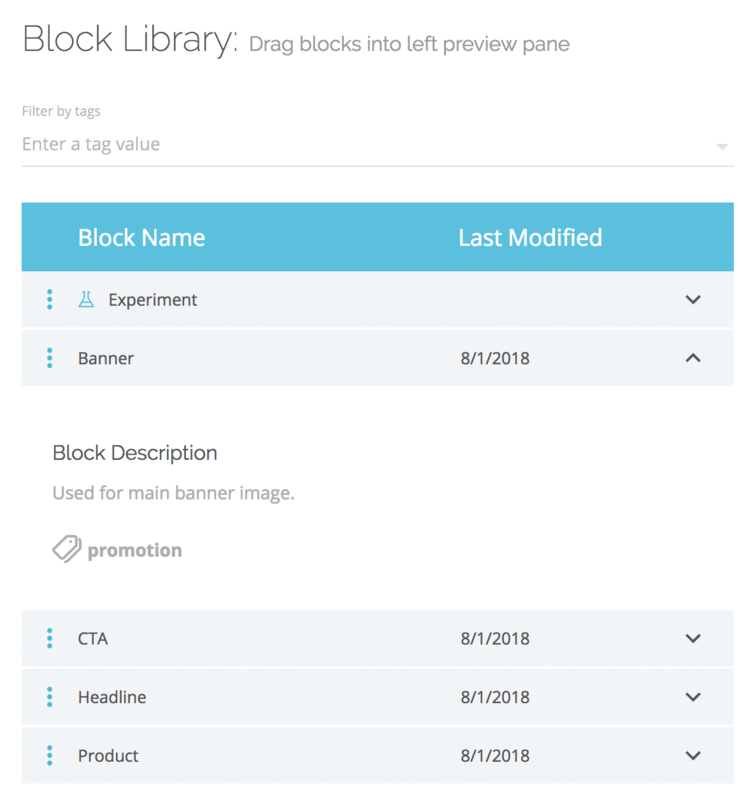 You will be presented with the Block Library page where you can view any available blocks and drag them into the template. Clicking on the arrow within a block will reveal more info and a description about the block. Select a block and drag it into the template to start building your layout. Once a block is dragged into the template, you can edit the content using the form in the right panel. After making changes to the form, the preview pane will automatically update, or you can click the Preview button to see the changes in the preview pane. Blocks within the template can be moved and deleted using the controls. You are able to add multiple Experiments to a message using the Experiment block. The Experiment block is a system block and will always be present as the first block in the block library when creating messages. 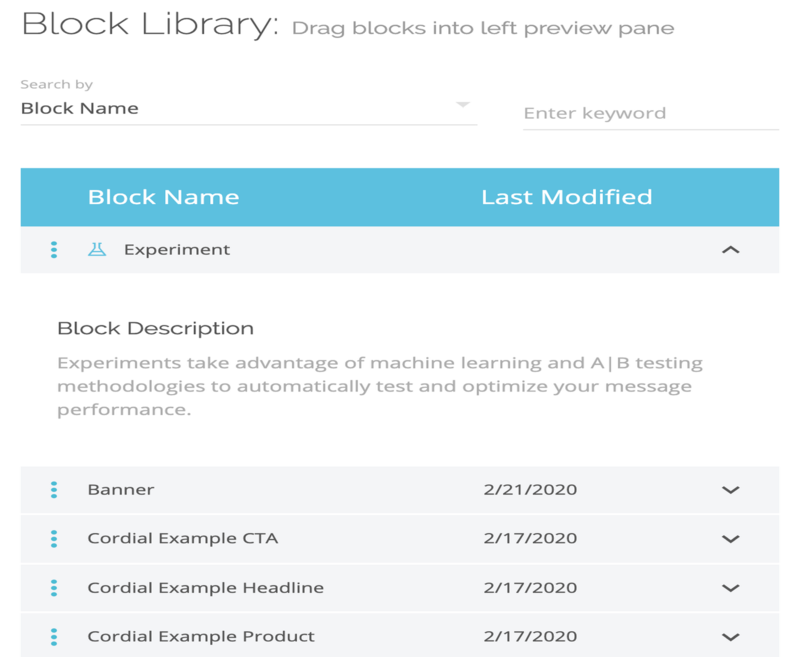 To add an Experiment to your message, drag the Experiment block into the template, configure the settings, and then drag content blocks for each variant in the Experiment. Once the Experiment block is added to the template, click on the block and edit the settings. Experiment Name - Add a name for the Experiment (underscores will automatically replace spaces in the name). Optimize - Choose a method for optimization. Experiment Strategy - Choose a strategy, Split or Split with Champion. 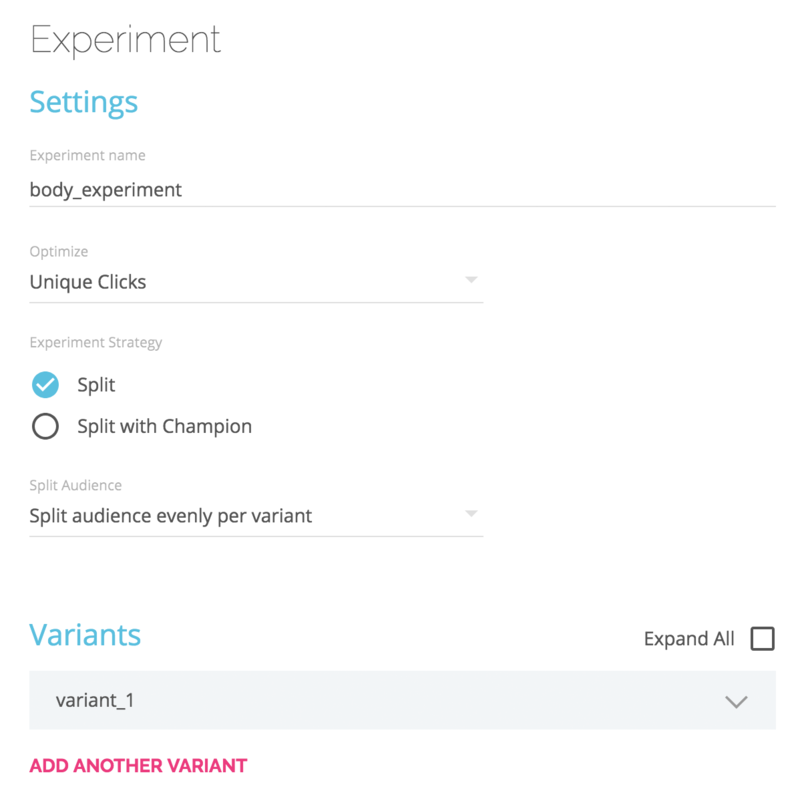 Variants - Choose how many variants you want the Experiment to contain. Once the Experiment settings are complete and you have added the desired amount of variants, you may drag blocks into each variant using the Variant dropdown. 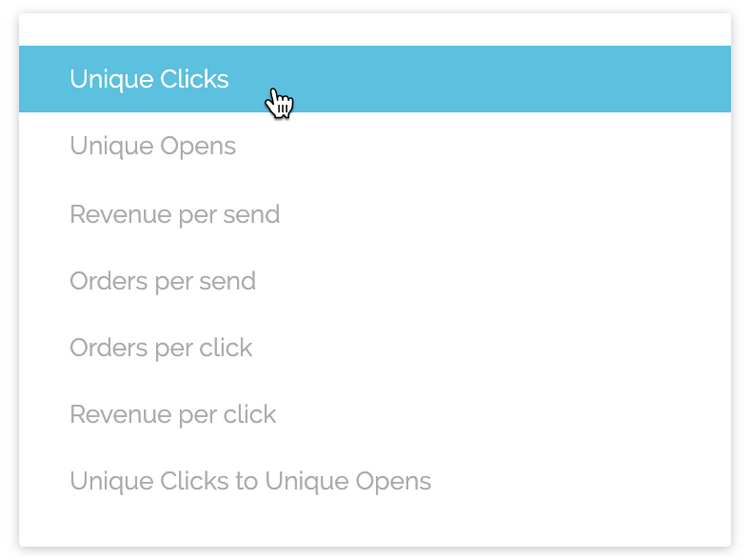 You may preview Experiments using the Variant dropdown in the Experiment block, or by using the Experiment preview button and choosing the desired Variants in the modal window. If there are settings with your template, they will be shown by clicking the Message Settings button. After adding blocks and customizing content, you can preview the message in the desktop view, the mobile view, or a split view by clicking on one of the preview buttons. Once you are happy with the layout and content of the message, click the Save Draft button to return to the Edit Message page. You will see the template displayed in the Message Content section. You can edit the content using the Edit button or delete the template by clicking the X button next to the template name. Note: Any changes made to the current message template will not affect the underlying Sculpt Template or Sculpt Blocks. Likewise, any changes to the Sculpt Blocks or Sculpt Template will not affect the current message template.